Spider Mouse - no, it's neither a cartoon spin-off of Spiderman nor the nemesis of the Simpsons' Spider Pig. Sure, that would be cool but Thanko has other ideas, like how to thoroughly creep out your spouse, co-worker or anyone who'd like to borrow your computer. Encasing a big, hairy, poisonous bug just where comp-users place their right hand is just the way to do it. I've written about strange computer mice before - the EMS Muscle Mouse, the Liquid-filled Mouse and the Cooler Mouse come to mind - but really those are just the tip of the riceberg. Indeed, Japan is the land of weird & wacky computer mice. Also USB keys, bizarre drinks & snacks and so on, but I digress. 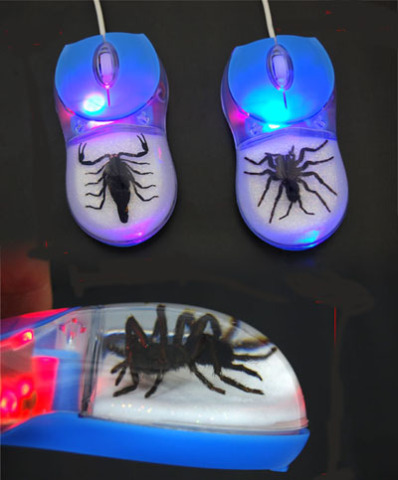 Nope, the 1,480 yen (about $15) optical computer mouse is in da house and kids, the best way to freak out Mom (and keep her out of your room) is to bring either the Spider Mouse or the Scorpion Mouse home to YOUR house. Thanko has thanko-fully sealed the varmints inside a pocket of clear gel to preserve them, and some internal red & blue LED lights just add to the sci-fi horror effect. The critters are most definitely real, by the way: the website notes that there's natural variation in the spiders' and scorpions' shape & size. UPDATE: These are now available in the U.S. You can find the Spider Mouse here and the Scorpion Mouse here. I saw this on the Thanko website and got the heebeejeebees- lol I could not bring myself to have it on our blog. You are brave Steve! !